The thrilling, true-life account of the FBI’s hunt for the ingenious traitor Brian Regan—known as the Spy Who Couldn’t Spell. Before Edward Snowden’s infamous data breach, the largest theft of government secrets was committed by an ingenious traitor whose intricate espionage scheme and complex system of coded messages were made even more baffling by his dyslexia. His name is Brian Regan, but he came to be known as The Spy Who Couldn’t Spell. In December of 2000, FBI Special Agent Steven Carr of the bureau’s Washington, D.C., office received a package from FBI New York: a series of coded letters from an anonymous sender to the Libyan consulate, offering to sell classified United States intelligence. The offer, and the threat, were all too real. A self-proclaimed CIA analyst with top secret clearance had information about U.S. reconnaissance satellites, air defense systems, weapons depots, munitions factories, and underground bunkers throughout the Middle East. Rooting out the traitor would not be easy, but certain clues suggested a government agent with a military background, a family, and a dire need for money. Leading a diligent team of investigators and code breakers, Carr spent years hunting down a dangerous spy and his cache of stolen secrets. 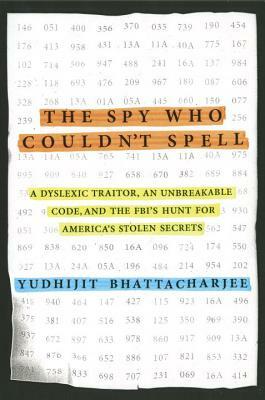 In this fast-paced true-life spy thriller, Yudhijit Bhattacharjee reveals how the FBI unraveled Regan’s strange web of codes to build a case against a man who nearly collapsed America's military security. Yudhijit Bhattacharjee is an award-winning writer whose features and essays on espionage, cybercrime, science and medicine have appeared in The New Yorker, The New York Times Magazine, National Geographic, Wired and other U.S. magazines. Yudhijit spent 11 years as a staff writer at the weekly journal Science, writing about neuroscience, astronomy and a variety of other topics in research and science policy. His work has been anthologized in the Best American Science and Nature Writing series. Yudhijit has an undergraduate degree from the Indian Institute of Technology, Bombay, and a master's in journalism from The Ohio State University. He lives in a suburb of Washington, D.C., with his wife, his two children and a big red dog.